Well, as they say, “Before you know, it will be Thanksgiving.” So far the days of summer are still here but I know that at the end of August the sky will start to show its fall haze and my friend Susan will say the light has changed. It feels like fall. Remember when you were a kid the first day of school and your teacher ask you to write something on what you did over the summer? Well, here goes. June started out with lots of old guests coming back to the Farmhouse and the weather was beautiful. 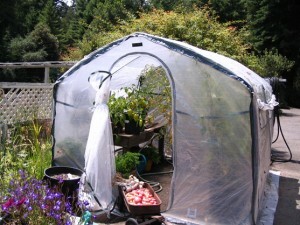 The garden was starting to do it’s thing and I planted my green house with tomatoes and peppers. So far the peppers are doing better. Tomatoes are so hard here. It’s just not warm enough but I do get some nice little Sun Gold tomatoes in the greenhouse. I planted zinnias and sweet peas in the garden along with sunflowers, zucchini, snap peas, beets and carrots. 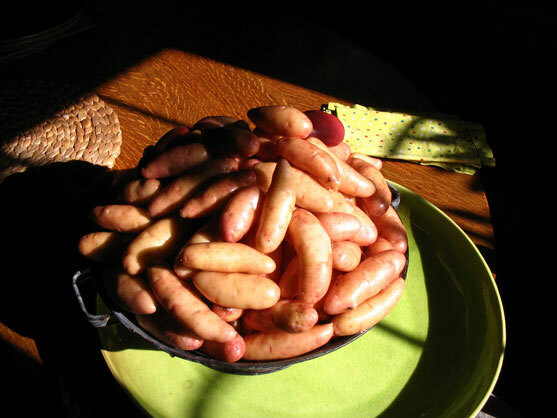 In March I planted my fingerling potatoes and now I’m harvesting them to put in omelets for breakfast. In late June I took a trip on the train to Reno to spend a few days with friends at their horse ranch and on the way home I got on the same train my eldest son and his family had traveled on from Boston on their way to Mendocino. We came through the Sacramento valley when the temperature was in the 100’s so getting back to cool Mendocino was a delight. 4th of July in Mendocino is always fun but to tell you the truth I avoid the town over the holiday. Too many people for me. Many of my guests appreciate the fact that the Farmhouse is out of all that bustle and come back to relax in the sun and quiet of the Farmhouse. 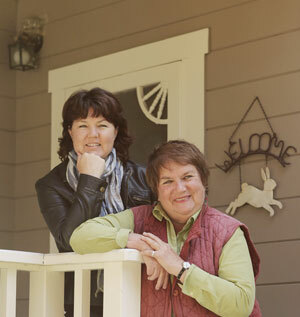 The Mendocino Music Festival (July 13-26th) is over and boy was it a good one. 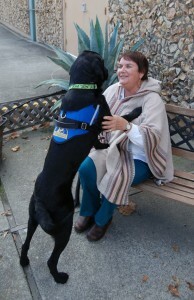 When it started some 25 years ago it was mostly classical music and an opera or choral piece. Now it’s all kinds of music including Jazz, World, and Latin. I saw an awesome Celtic ladies group. They were so entertaining and even had step dancers. 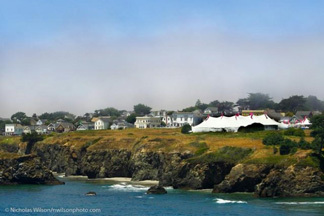 The festival is two weeks of performances in a big tent on the cliffs above Mendocino. 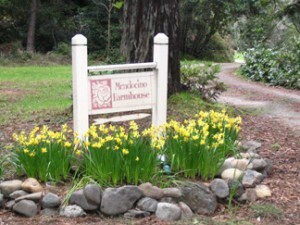 Summer is not quite over yet and there is still plenty of time to enjoy all that Mendocino and the Farmhouse has to offer. 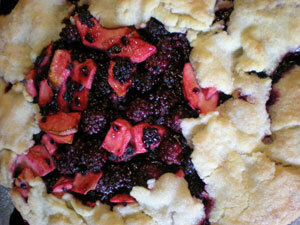 It never fails here in Mendocino in March. The daffodils start popping, the garden shows color and the season changes. There has been very little rain so far this year and we need our rain both early in the season and later so the wells fill for the Summer months. I was glad to see the rain we got last week, but we need a lot more. 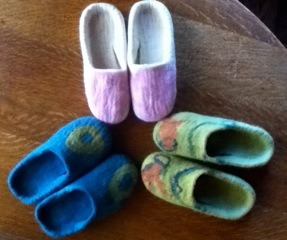 The Felting work shop with Carin Engen was a great success with everyone leaving with a pair of felted slippers. Call me if your are interested and we will set up another time. 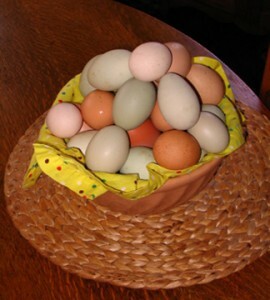 Last but not least my chickens are starting to give me lots of eggs. Of course I use them for breakfast in lots of different ways. They are the best. Good girls! Karin and I are hosting a workshop weekend at the Farmhouse with Carin Engen the master felting guru of the North Coast. 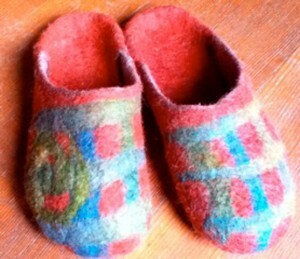 Carin has done several felting classes at the Farmhouse and this time we are going to do felted clog slippers. Learn the ancient technique of wet felting while making a pair of comfy, warm clog slippers. You will make a template to fit your feet perfectly. The workshop will start Saturday February 9th at 10am and will last about 6 hours with a lunch break. Why not make a weekend out of it and come with a friend. I’m offering a very special rate on the room. It’s also possible to take advantage of this special rate and bring someone who doesn’t participate in the class. Cost for the weekend is $195 plus tax and materials fee. The weekend includes room for two nights, Felting Workshop on Saturday, breakfast and a hearty lunch on class day and breakfast on Sunday. One night stay with everything above is $`115 plus tax and materials fee. Class only with food is $55 plus materials fee. 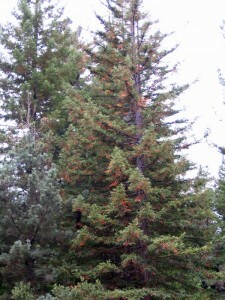 My maple trees are turning red and orange and the redwood trees are showing their colors as well. Yes, even the redwood trees show an orange colored leaf that is deep in the branches and falls over everything when the first rains come. When that happens the road coming up to the Farmhouse and also Comptche-Ukiah Road is lined with duff. Cars driving over it create a roadway that looks like new fallen snow except it’s orange. Very pretty. 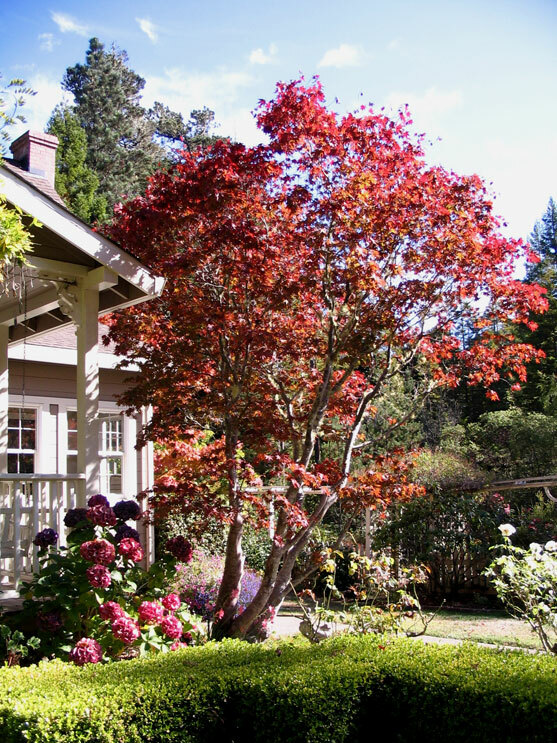 When the Farmhouse garden was planted soon after the house was finished I planted two Red Maple trees which are both at least 30 feet high now and this time of the year they are quite spectacular.